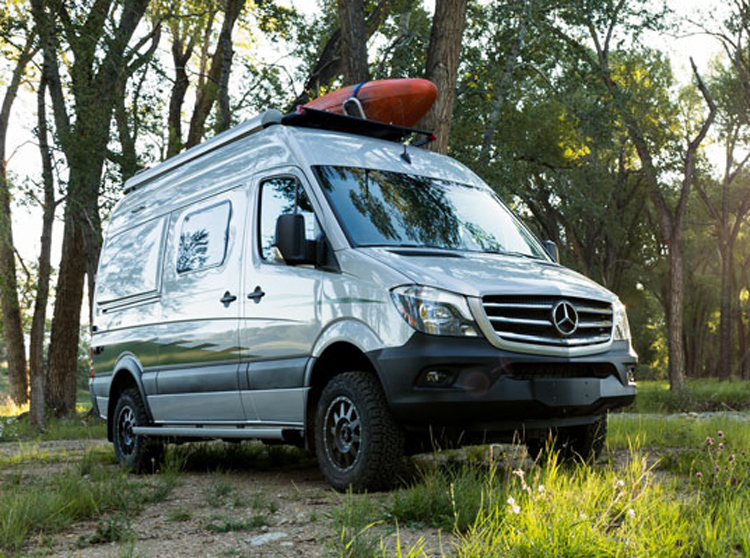 The Winnebago Revel 4×4 was designed specifically for active outdoor enthusiasts, the all new Winnebago Revel takes a no nonsense approach to adventure with a straightforward design and function-driven features. Taking full advantage of the proven 4×4 Mercedes Benz Sprinter chassis, the Revel’s 3.0 litre turbo diesel puts 325 lbs ft of torque through an on-demand 4WD system, complete with high and low range and hill descent mode for added off road capability. Storage and living space are maximized by the flared body and Power Lift Bed that converts to a 49 x 79 inch sleeping surface. Welded aluminum cabinet face frames, dual pane windows with insulated shades, and snap in screens for fresh air circulation all contribute to the Revel’s off the grid livability. Watch a video about the Winnebago Revel’s Safety Features here. Seat Belts: Both cab seats have 3-Point Seat Belts and the seat belts in the bench seat are lap belts, but they are bolted to steel unlike most other RV manufacturers that bolt them to plywood. Entry Assist Handles: Jump into your Revel safely with the entry assist handles and the running boards. BF Goodrich T/A KO2 Tires: Advanced tire footprint shape results in more evenly distributed stress, for longer more uniform wear. Interlocking Tread Design provide increased tread block stability, for more even wear over the long haul. The tires upper Sidewall Traction Bars provide increased mud, snow and rock traction, especially in aired-down driving situations. The rubber in the tires are split and bruise resistant , derived from BFGoodrich’s race proven Baja T/A® KR2 tire. The increased rubber thickness, extending down the sidewall to protect more of the critical sidewall failure zone and the advanced deflection design deflects protruding objects from snagging and splitting the sidewall. Mercedes-Benz Adaptive ESP System: This dynamic handling system actively intervenes to help keep the van firmly under control and safe by automatically braking individual wheels and reducing engine power to help stabilize the vehicle if wheelspin, understeer, or oversteer is detected. Mercedes-Benz Safety Enhancement Package: The all new safety enhancement package offers Revel owners light and rain sensor for automatic headlight dimming and wiper controls, blind spot monitoring with indicator warning lights in side mirrors, collision prevention assist, lane keeping assist, high beam assist, first aid kit, emergency flashlight, leather wrapped steering wheel and Mercedes insulation in cab doors. To Find out more about the Winnebago Revel CLICK HERE. To see Winnebago Revels in-stock CLICK HERE. ← RV Insurance: Are You Properly Covered?